Club Blue Miami, Young Professionals for the Boys & Girls Clubs of Miami-Dade invites South Florida’s young professionals to enjoy an evening of networking and cocktails at the oceanfront James Royal Palm, located at 1545 Collins Avenue, Miami Beach. 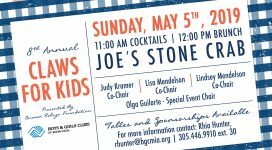 With a modest $25 minimum donation to Boys & Girls Clubs of Miami-Dade, attendees will enjoy passed hors d’oeuvres and a cocktail courtesy of James Royal Palm. Sponsorship opportunities are available. For more information about sponsorships, please contact Kati Foley at (305) 446-9910 ext. 30, or via email at kfoley@bgcmia.org. Thank you, Allstate Insurace for graciously sponsoring Valet Parking for the evening.